Beside keyboards, handles and tea/dish towels hygiene on the toilet belongs to the bacterial trouble spots. According to studies, about 90% of people do not use a public toilet, without making sure that the toilet seat is clean and completely free of any pathogens or dirt. Toilet hygiene, beside proper handwashing, is among the most important precautions. Sometimes, however, the situation is urgent- and you have no choice. One does not even sits down and dislocate his back in constant stooping. The other uses the most common technique at public toilets in order to protect himself against viruses, germs and bacteria: the “Papers-method”. Piecemeal assigned to the toilet with single sheets to cover the toilet seat as best as possible. That takes a long time, is cumbersome and doesn’t work anytime. 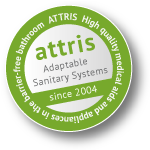 The Safe Seat Toilet-System SST provides the solution to a non-contact toilet use. The system is attached directly to the existing toilet. Sensor triggered, it covers the toilet before each use with a protective paper which is automatically removed with the flushing. Inform yourself on the following product pages Safeseat Toilet, how you can provide a perfect solution for toilet hygiene in public toilets.